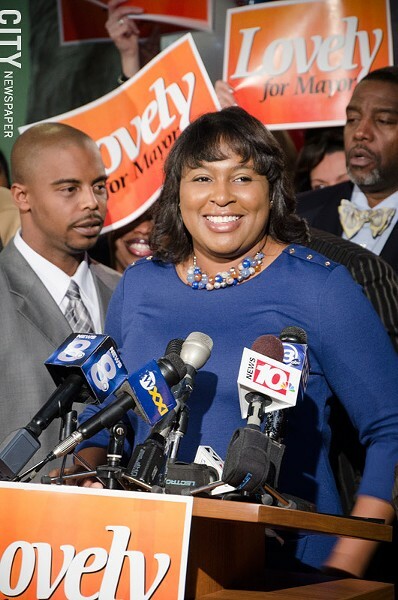 PHOTO BY MARK CHAMBERLAIN Lovely Warren launched her mayoral campaign today. Not that this was a campaign in search of a narrative, but if there was any doubt, it was settled this morning by Lovely Warren's choice of settings to launch her mayoral campaign: the Fight Village Apartments on Ward Street in northeast Rochester -- one block, Warren pointed out, from the flashpoint of the city's race riots in the 1960's. It's clear that there are segments of the community who feel left out of the conversation when officials talk about Rochester's economic recovery and revitalization. It's also clear that City Council President Lovely Warren has been planning this bid for some time: there were signs, a banner, literature, and a campaign-style video playing at this morning's press conference. Warren, sounding much more confident than she did at a meeting of Democratic insiders earlier this week, said elected officials need to "focus on families, not just buildings," when they talk about bringing the city back. "I believe that neighborhood development is just as important as downtown development," Warren told the exuberant crowd. "Some have said to me, 'It's not your time.' It is not my time, it is our time." Attendees at the press conference included City Council member Adam McFadden; Monroe County Legislator Willie Lightfoot; Rochester school board member Cynthia Elliott; Allen Williams, who sits on the board of trustees of Monroe Community College; and State Assembly member David Gantt, Warren's boss and mentor. Standing at Warren's side, Gantt wiped away tears during the press conference. Warren's entry into the race puts the total of official mayoral candidates at two. She'll have to primary incumbent Mayor Tom Richards, and Rochester businessman Alex White is looking to enter the race on the Green Party line.